If you give advice of any kind for a living, then you know how hard it can be for clients, patients, or customers to follow your wise counsel. There are many possible reasons for this difficulty, ranging from competing demands on their time and energy to frank errors made by you, the advice-giver. 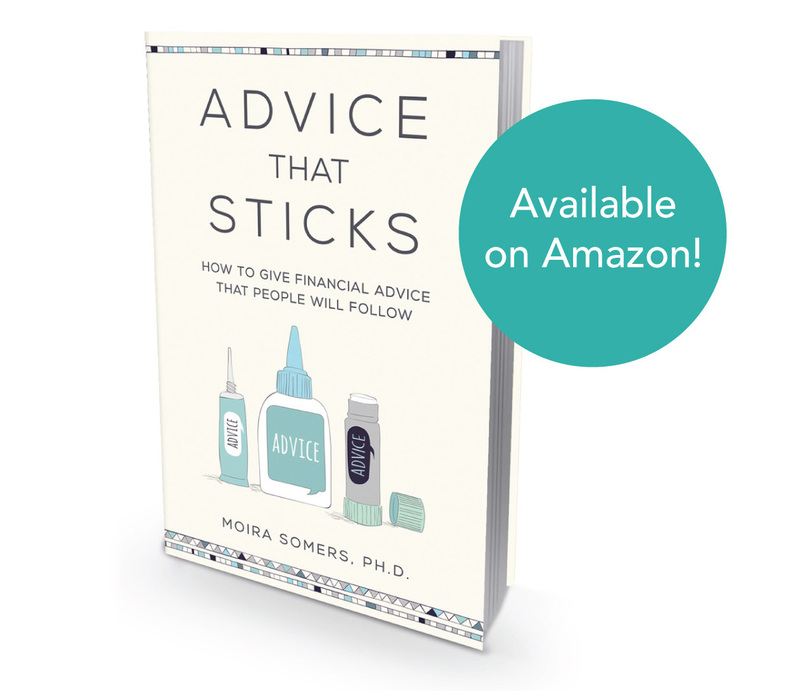 Advice that Sticks takes aim at the problem of unimplemented financial counsel. It is a down-to-earth primer on advising — that is, on developing real-world skills for intelligent advice delivery. Dr. Moira Somers has integrated her extensive clinical and consulting experience with research findings from the fields of neuroscience, behavioural economics, medicine, and positive psychology. 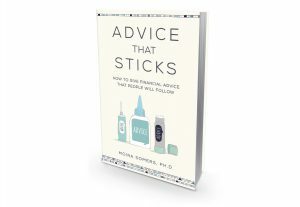 The result is a thoughtful, funny, but above all practical guide for anyone who makes a living providing financial advice. 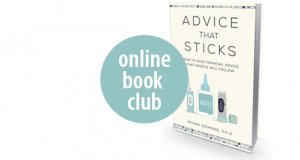 Join the author on an online book club on Thursdays in May, starting May 10. Finally, someone is willing to tackle the complex issue of client compliance and how change occurs in the area of personal and business nance. Written by an expert in the field of financial psychology, the book delivers humility, humor and wisdom. It guides the reader in learning how to close the gap between good intentions and actions. This is a great book! A worn and dog-eared copy belongs on the bookshelf of every financial advisor who views financial planning as a calling and a profession. Consumers know they need to do things differently with respect to their money, but are often dismayed or baffled by their own self-sabotaging habits. Financial professionals have not always known how to be helpful in creating lasting behaviour change. They’ve relied too much on the provision of information and the occasional stern lecture. This book will change all that. It is superbly written, and well-positioned to help a lot of people.